In the words of Mr. Spock, "Live long and prosper." The phrase made its way into my mind today whilst thinking about Chinese New Year. I wondered if the family will find it amusing if I greeted them with a long-live-and-prosper instead of the traditional 'Kong Hee Fatt Choy'. Hard to tell, but I intend to try it this year. Peanuts are said to be a symbol of long life. 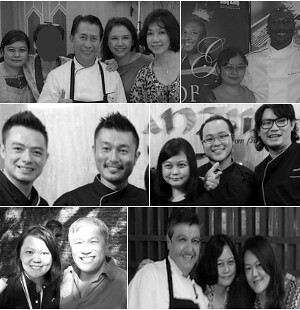 That is why I have always included it in festive goodie bags, which I give away to closest friends and family. Besides the packet of peanuts, this year's bag contains longevity noodles, nian gao, red dates and mandarin oranges. 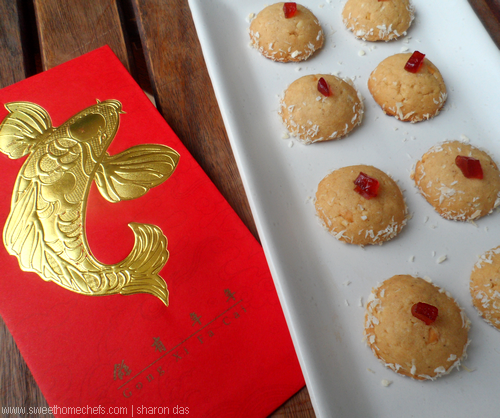 Since we are now weeks away from Chinese New Year and I coincidentally had a jar of peanut butter which will be expiring soon, it just seemed apt to bake it off into festive auspicious cookies to be given away. Hubs loves peanuts. He was thrilled to find out I was making these. I wasn't. You see, I'm not a big fan of peanut butter, but surprisingly I was addicted to eating these. 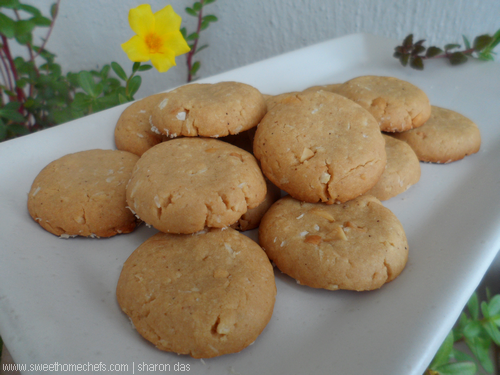 These cookies are peanut buttery and dense. Personally, I find cookies like these best enjoyed in small portions. Hence, I made them bite-sized. 1) Pre-heat oven to 165C. Line tray with baking paper. 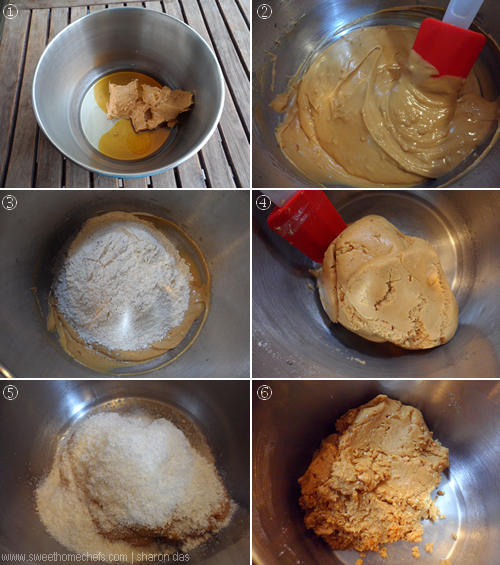 2) Using a mixer - beat cooking oil, honey and peanut butter until combined. 3) Sift flour, baking powder and ground nutmeg over the mixture. Add salt. Mix with a baking spoon. 4) Add dessicated coconut. Mix to combine. 5) Press some of the dough into a rounded 1tsp baking spoon. Slide it out. 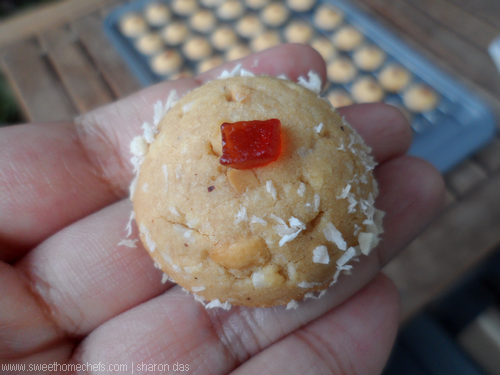 Gently dip the bottom of the cookie dough onto some dessicated coconut. Roll some onto the sides too. Top with a candied cherry bit. 1) Mix wet ingredients together. 2) Combined wet ingredients. 3) Sift the dry ingredients over. 4) Combine wet and dry ingredients. 5) Add dessicated coconut. 6) The dough is ready to be shaped. 7) Use a spoon to shape the dough. 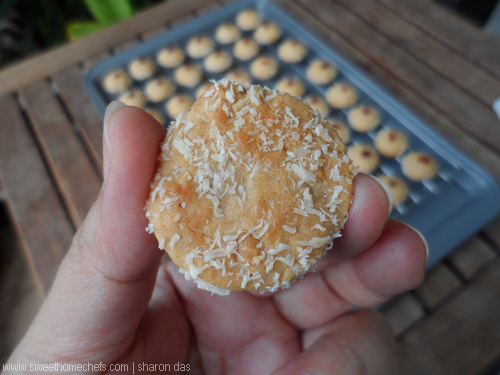 8) Dip the bottom of the dough onto the coconut. 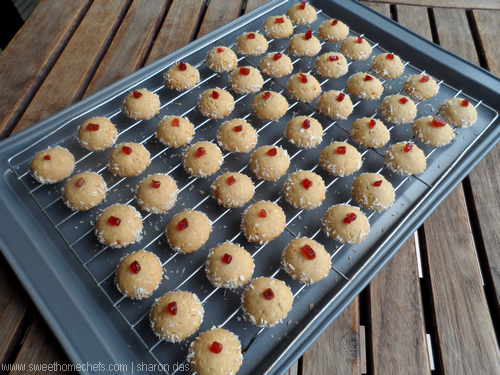 9) Top with candied cherry. 10) Bake! 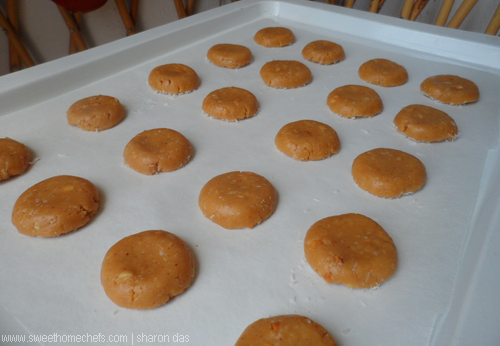 Peanut Butter Cookies Fresh out Of the Oven! The cookies pictured above were the festive version. These, on the other hand, were made without the candied cherry. I have flattened the cookies a little. But I still dipped the bottom of the dough with coconut to keep it from browning too much. I packed them into plastic containers the next day. Off it went to business acquaintances! 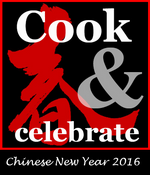 This post is linked to Cook and Celebrate: Chinese New Year 2016, which is hosted by Yen from GoodyFoodies, Diana from The Domestic Goddess Wannabe and Zoe from Bake for Happy Kids. We are crazy for peanut butter cookies. I love that you flavoured them with nutmeg. 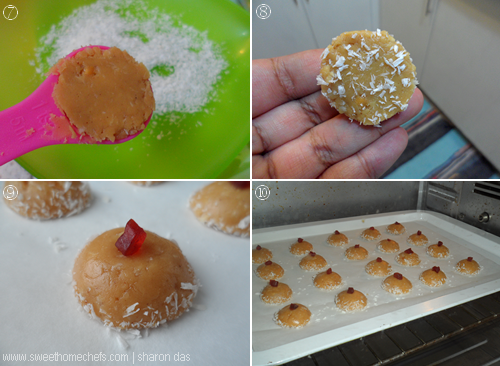 Thanks for linking this delicious PB cookies with us at Cook and Celebrate!